Outstanding!- very flavorful! (Very peppery though... I'll cut some out the next time). For all ya'll who have referred to the soupy nature of the cooked greens... that's the "pot likker", the liquid that remains after you cook your seasoned greens! Many Southerners prize this flavorful watery liquid, and reserve it to dunk their cornbread in. 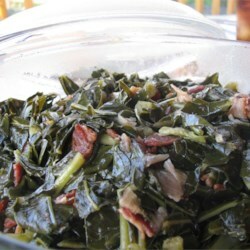 It is messy but common thing to do after making collard or turnip greens. There are various ways you can do this: Some folks serve the greens somewhat soupy. But we like our greens strained, and on the same plate as our blackeyed peas and ham. So before we serve greens, we ladle some of the pot likker off the collards and put a little in a small bowl next to each plate for dunking. Then we use a slotted spoon to strain and remove the collards to a serving bowl. A different thing some people do is to ladle the pot likker, often with a splash of Hot Sauce, onto their cornbread... but I think that makes it too soggy.